if you pull the springs off the shocks, how far does the rear wheel go up when bottomed? can you cut the guard out and lower the seat that way. longer shocks to tip the back up, then drop the back of the frame sectiondown. do those chrome bits bolt on, or they the actual frame bits? The rear wheel will hit the mudguard, I know this because the shocks on my Intruder on the Isle Of Man are knackered and the tyre has polished underneath the mudguard. The seat height will be just under 800mm allowing for suspension sag, that's fairly high but not a problem because I'm 6'2". This seat height enables a moderate knee bend of about 90 degree and a footpeg height of 300mm, that's plenty of clearance because they will be in close. I want to keep the shaft angle about as it is designed, I don't want to load up the universal. The chrome bits bolt on, their only function is to support the mudguard, but I want to keep them because they form part of the Intruder 'look' which I want to keep. That's also why I kept the tank, albeit a bit longer, and kept the rear mudguard with it's duck tail, albeit trimmed a bit, just a feather left. So far I'm happy with the configuration, as I said perhaps the tank is an inch or so too long on the 1st bike but nothing disastrous. The main bugs with the standard Intruder is the too upright riding position (for me), I had to pull myself forward with my arms, poor front brake, poor footpeg ground clearance and small petrol tank. Ok, the riding position is changed by default due to the change of genre and the other problems have been addressed. Hopefully I will end up with a couple of neat bikes, time will tell, but both will be unique. Some may say 'Thank God for that', and that's ok too. It's just as well I'm going to live forever otherwise I'd never finish this project. I've learnt a lot about spray painting lately, mostly about what not to do, but I'm getting there. I've painted the all the small bits, sort of, I'm now nearly ready to do the tank, I'm so confident that I'm not brave enough to start, I'm just waiting for my desire for perfection to totally disappear, and then I'm into it. In the meantime I've been watching utube, learning lots of stuff about Brexit, Mueller, Trudeau, global warming .... lots of stuff. I've ordered my MAGA hat on Ebay, enuff said. 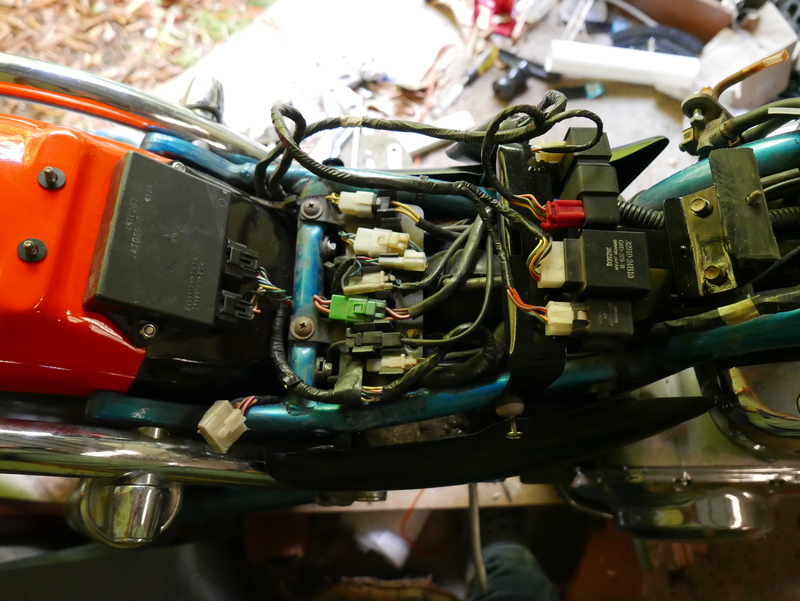 However, I've made some progress, I've mounted the relays and ECU and figured out where the battery will go. I imagine that a lead acid battery would not like being mounted on it's side so I'll fork out for a lithium ion one.